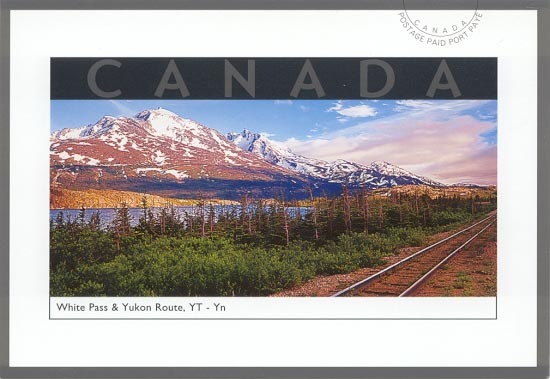 On May 11, 2001, Canada Post issued a 60-cent stamp honouring the White Pass & Yukon Route railway as part of their Tourist Attractions series. As well as the regular postage stamp, the postcard below the stamp was issued. 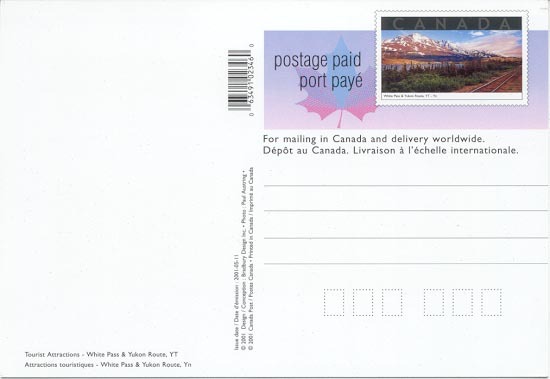 It features the image of the stamp as the photo, and the stamp (without the denomination) is printed on the mailing side of the card. The stamp was designed by Bradbury Design, Inc., based on a photograph by Paul Austring. It shows the rail line as it traverses the White Pass near Fraser, British Columbia. The design was not particularly popular with rail fans, who had expected a train to be featured or at least shown in some manner on the stamp.